Austria's pop scene presents itself again at the Popfest on Karlsplatz. Performers this year include Naked Lunch, Mavi Phoenix and Kreisky – and all with free admission. Save the date: July 26 to 29. 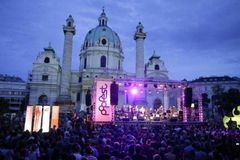 The Vienna Popfest offers Austrian musicians and a number of international guests a highly respected live platform for innovative pop music in its various guises for the ninth time. The playing continues for four days and nights on Kunstplatz Karlsplatz, both open-air and indoors in the art and culture establishments. This year's opening night on the “Lake Stage" in front of the Baroque Karlskirche (Church of St. Charles) - after the prelude by the garage-rock musicians Dives - will be played by the great local indie-rock pioneers Naked Lunch. The dazzling R&B singer and rapper Mavi Phoenix concludes the first open air day. Also confirmed are lake stage appearances of the rock band Kreisky, with their new album "Blitz", the grunge trio Aivery and the Viennese hip hop crew Kreiml & Samurai. There are many new names to discover in domestic pop: for example, the accordionist Alicia Edelweiss, the already hyped Viennese songwriter Felix Kramer or the multilingual rapper AliceD. The internationally touring experimental electrician Jung An Tagen and the artificial pop-light figure Farce will also make their pop debut. An extensive supporting program with prominent panels, live showcases and discussions rounds off the pop festival.